As a scientist you obviously require the best quality product from stores. However not all stores provide you with the purest form of peptides necessary for your research. This might give you undesired results in your experiment. Pinnacle Peptides understands your needs to have only the best quality chemicals for your experiments which is why only the best items are delivered to you. 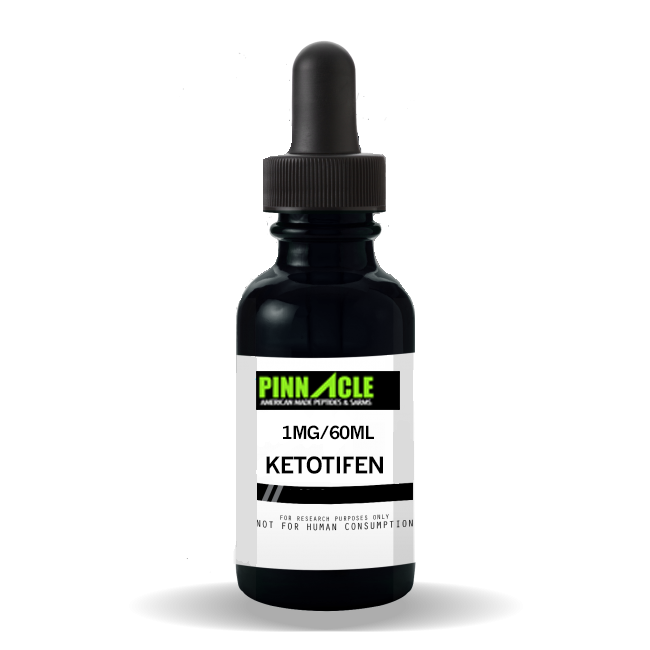 Buy KETOTIFEN in its purest form and ensure higher levels of accuracy in your experiments, now available from Pinnacle Peptides The Liquid Ketotifen is a product that is a second generation mast cell stabilizer. Research has shown that this peptide in the liquid form when attached with clenbuterol can be used for the treatment of Asthma. It does so because it can up-regulate the beta 2 adrenergic receptors. There are also many other benefits of this chemical. But it is still under study, which is why if you need them for your research purposes you can avail them from Pinnacle Peptides. KETOTIFEN is a highly effective chemical that inhibits phosphodiesterase. This liquid has also been used for medicinal purposes. Some vials when prescribed by doctor can be used in the treatment of pink eye. But that is essentially ophthalmic Ketotifen, which again should not be used unless it has been prescribed by the physicians. Pinnacle Peptides have been trusted by scientists and researchers over the years for providing the highest quality of peptides in the market. If you need KETOTIFEN you can avail it from the online store at the best prices in the market. No matter what your lab requirements are, Pinnacle peptides aims to provide you with all supplies. It is your one stop store to shop for all your lab requirements. And you need not worry if you are a non resident of USA as Pinnacle Peptides delivers supplies in international markets as well. The products we offer are intended for laboratory research use only. In purchasing any of these items, the customer acknowledges that there are risks involved with consumption or distribution of these products. These chemicals are NOT intended to use as food additives, drugs, cosmetics, household chemicals or other inappropriate applications. The listing of a material on this site does not constitute a license to its use in infringement of any patent. All of the products will be handled only by qualified and properly trained professionals. All customers represent and warrant that through their own review and study that they are fully aware and knowledgeable about the following: Government regulations regarding the use of and exposure to all products. The health and safety hazards associated with the handling of the products they purchase. The necessity of adequately warning of the health and safety hazards associated with any products. Pinnacle Peptides and www.pinnaclepeptides.com reserves the right to limit and/or deny sales of products to any unqualified individuals if we have reason to believe that misuse will occur.